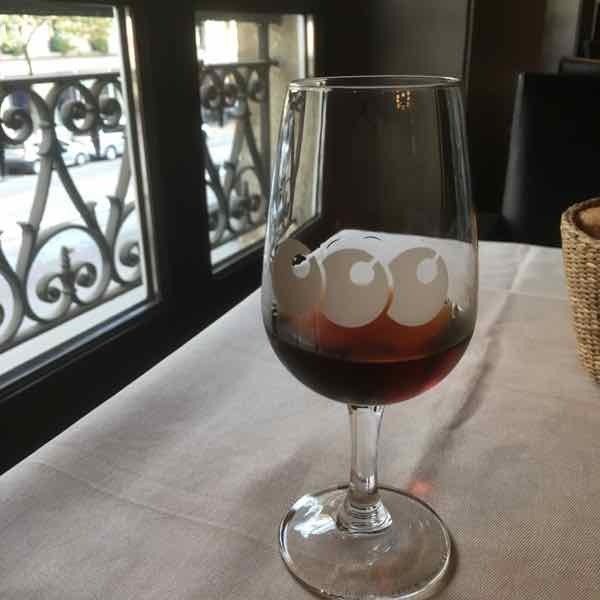 French food is more than just steak frites, moules, foie gras, and camembert and I did not choose to eat at Pomze restaurant in Paris just because of its excellent reviews. Nor did I choose it because it is a trendy restaurant that serves unusual and unique dishes. I chose to have lunch at Pomze because I have an addiction; an addiction to apples. I love to eat anything made with apples: tarte tatin (apple pie), apple crumble, pork with apples, apple fritters, apple crisp, apéritif Pommeau…..well, you get the drift. Imagine my surprise and excitement hearing that Pomze restaurant was just the place that specializes in dishes made with apples. And while I loved my lunch at Pomze, the after-lunch experience made my day (read on!). Pomze is located in the 8e arrondissement of Paris, not far from the department store Galeries Lafayette. In 2006 Pomze was conceived by two brothers, Daniel and Emmanuel Dayan, who were both born in Paris. Nicholas Soliman is the head chef and he is continuing the innovative culinary creations originally started by Japanese chef, Kenichi Handa, who was with Pomze for seven years before moving on to be chef at the Ritz Plaza Hotel in Paris. So why the name “Pomze”? It’s like the French word for “apple”; however the reason for the “ze”, we are told, is a secret. 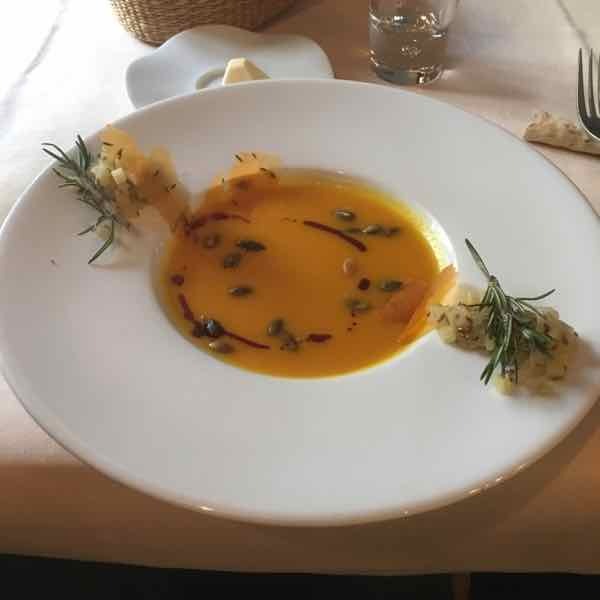 The restaurant stresses the use of local products with a foreign flavour and all of Pomze’s dishes are centred around apples. 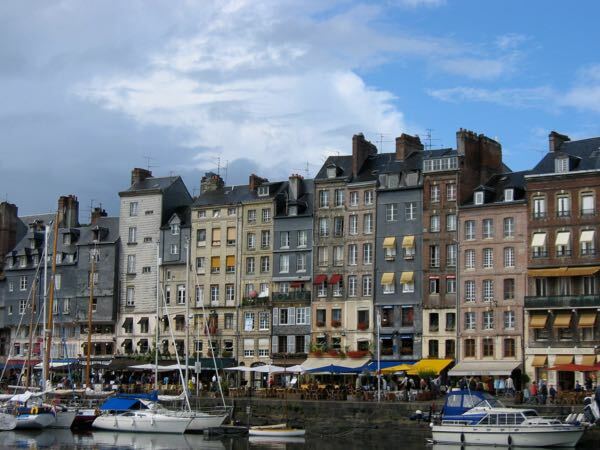 They use producers from Normandy, Brittany, the Basque and Pays d’Othe regions and many of their dishes are gluten-free and vegetarian. They are also very accommodating to those who have food allergies. While one could initially say this restaurant just has the “gimmick” of apple dishes, it is not and once you see the decor, experience the service, and taste the dishes you will agree the restaurant takes their business seriously. Not at all a gimmick. From the minute I walked in to Pomze I was warmly greeted and taken to the 2nd floor which has the main dining room and 3 private dining rooms. Nothing overly fancy or pretentious with the decor. 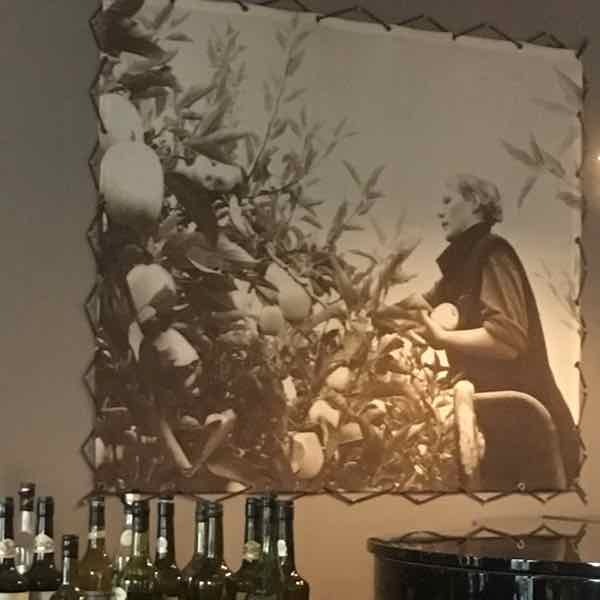 Just subtle apple accents and a big photo of apple picking in an orchard covering part of one wall. I was so tempted to get the Cider tasting which included 3 glasses (14cl) of cider paired with my meal but instead I got a glass or wine. In hindsight I wish I had tried the ciders. C’est dommage. Next time. I am very happy, however, that I got a glass of Pommeau as it is rarely found outside of Normandy. It is a mix of apple brandy (Calvados) and apple juice. 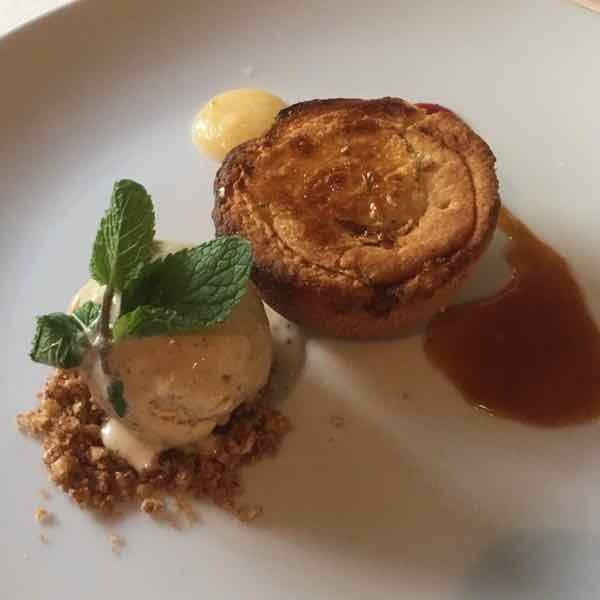 Quiberon-Cortland apple pie shortbread, with hazelnut butter and cinnamon frozen cream (ice cream). After lunch I headed downstairs and asked were the boutique was. I had read that they sold chutneys, Calvados, and other “apple” food products. The boutique was located opposite the bar and the gentleman who answered me happened to be Daniel Dayan, the owner. As I explained to him that I was interested in buying a bottle Pommeau, he handed me an apple from a large bowl of apples on the bar counter. He said had two types of Pommeau and that I should taste both of them before deciding. 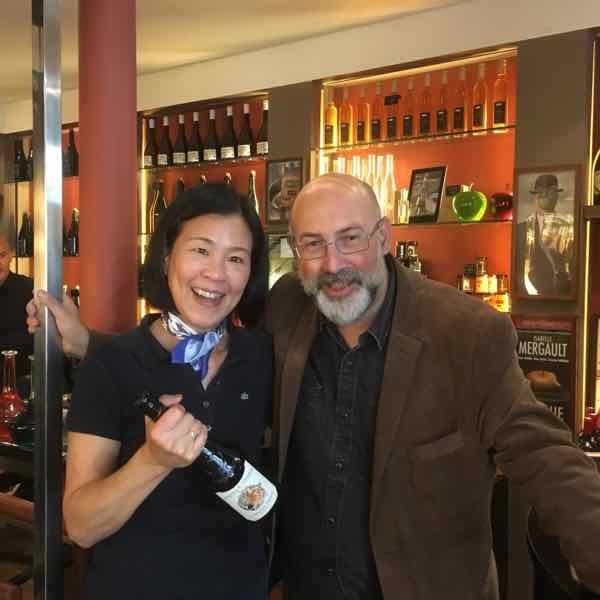 So, there I was sipping one Pommeau that had won an award and another that Daniel felt was actually better; it had fewer tannins and was smoother. I bought a bottle of the latter, knowing that I would somehow figure out how to pack it in my suitcase. There are very few places in Paris that sell Pommeau so I HAD to buy a bottle. [Now of course I wish I had purchased two]. Before leaving, Daniel gave me another apple! Maybe he knew I had this “apple” addiction. 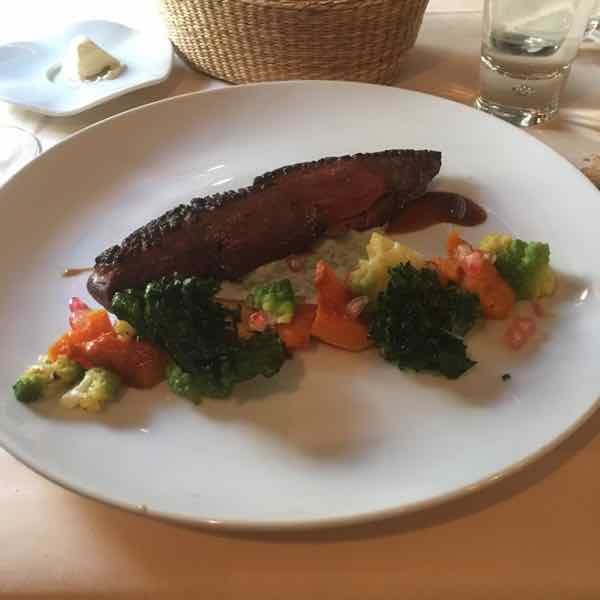 My lunch at Pomze that day was absolutely delicious and temporarily satisfied my apple addiction; however, I will be returning to sample more dishes the next time I am in Paris. 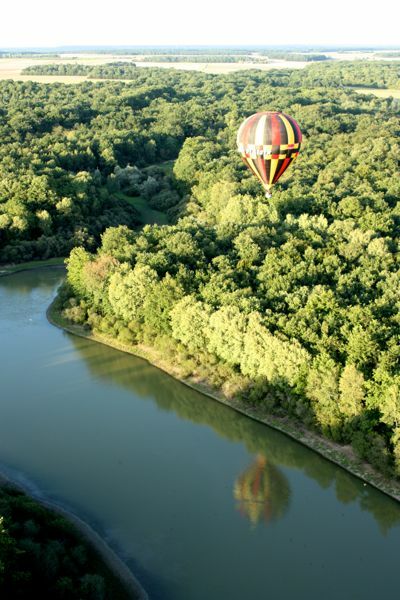 Here are more unique experiences in Paris. What a fabulous lunch Jan. Interesting to learn about your addiction to apples. We had Calvados while in Normandy and it was delicious. I would love to try that cider tasting too. 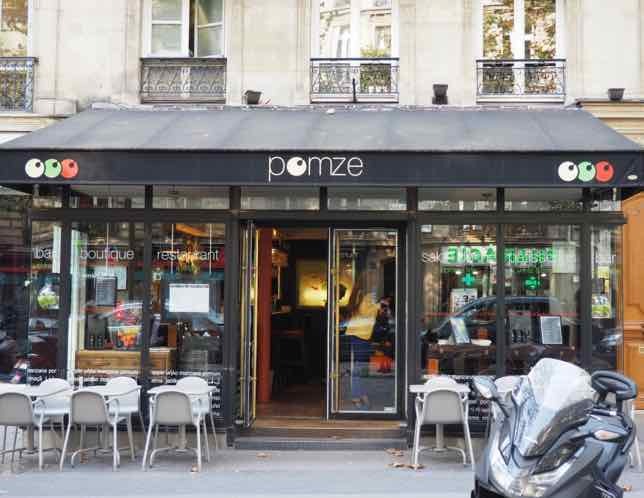 I’ll be putting Pomze on our list of places to eat on our next trip to Paris. Thanks for the recommendation. You’re welcome. You’ll have fun there! What a delicious sounding meal. Great description. Thanks for sharing, Jan.
You’re welcome. Hope you get back to Paris soon! This reminds me of once doing a Calvados tasting in Normandy. We started with the young stuff (delicious but still a bit raw) and progressively moved to the smooth old ones. As the Calvados got older and older it tasted better and better and my knees got wobblier and wobblier. Ouf, Calvados is strong! Yes, Calvados is strong…too strong for my liking. Which is why I prefer Pommeau!